Sarah Polley has spent more than half her life thinking about Alias Grace – from the age of 17, when she first read Margaret Atwood's award-winning novel, to now, at 38, as the six-hour miniseries she adapted from it is poised to premiere at the Toronto International Film Festival, followed by runs on CBC and Netflix. That is 21 long years of untangling the true story of Grace Marks, a servant who immigrated to Upper Canada from Belfast in the 1830s, and who became an object of public fascination after she did or didn't murder her employer and his housekeeper. That is two decades of Polley buying the rights for herself; hanging onto them through two pregnancies; making a prize-gobbling documentary ( Stories We Tell) that was directly influenced by Alias Grace's theme of multiple truths; failing to wrestle the book down to a two-hour feature; re-thinking it for television; and finally writing all six hours of the series – often in 90-minute snatches during her daughters' naps – before pitching it to networks. Along the way, Polley grew from a precocious child actor to a political activist to a lauded screenwriter/director. 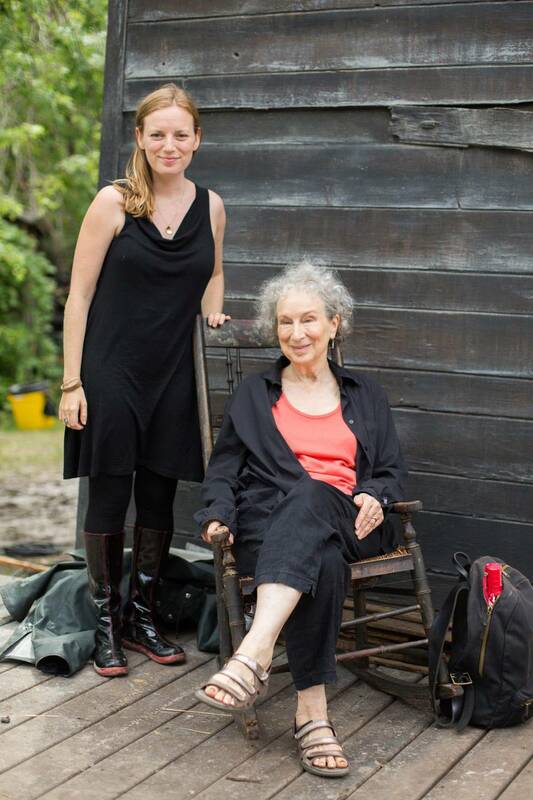 Her relationship with Atwood has evolved, too, from that of acolyte/teacher to outspoken friendship (often bracingly so), a torch-passing of sorts between two genius Canadian women. Yet only now, with the script behind her, is Polley understanding the reasons Alias Grace burned itself into her. "As a 17-year-old, all I knew was that I couldn't stop reading it," she says in an interview. "Then I kept returning to it. Having my life echo in the book, and the book in my life, has been a huge part of my figuring out who I am." Then she sighs, and answers the question: "Of course it's terribly flattering. Sarah's extremely experienced, so I knew I was going to get quality. That's why we preserved the rights for her [for many years]. She said she wouldn't make it unless she got the right budget [$30-million]. And she meant it." Polley knew some of why the story gripped her. As a political activist, she was excited by Atwood's take on the 1837 rebellion: "It's a better story than the American Revolution," she says. "But the rebels lost, so it doesn't get told." As a white, middle-class Toronto teenager, it was eye-opening for her to see "what women had been through, what they continue to go through," and to realize that her life of freedoms is a blip in human history. But her deeper reasons were only revealed to her after "decades of therapy," she says with a laugh. "The splitting of a personality that happens because of trauma or a damaged childhood" – as happens with Grace – "gripped me in this unconscious way," she says. "What happens to a person when she can't express anger? What does she become capable of? What is hidden from her about herself? Now that I've lived the years that Grace lives in the book – she goes from 15 to her early 40s – I understand more about why I connected with her duality." Obviously, Grace experienced far more trauma than she, Polley says. But her own "not ideal" childhood – her mother died when she was little, she went to work young, she lived on her own at 14, plus other "stuff I'll keep private" – when filtered through Grace's story, made Polley realize that "sadness and anger don't disappear, they go somewhere else. They mutate. You develop a self that's not acceptable, which you keep hidden, and a self that is, which you present to the world. It's not even conscious. But getting to know the self that's been hidden is one of the most interesting things in life." Alias Grace is the culmination of Polley’s two-decade journey of trying to obtain the rights to film it having been gripped by the source material. Throughout Alias Grace's episodes – directed by Mary Harron, the miniseries stars Sarah Gadon as Grace, Paul Gross as her employer and Anna Paquin as his housekeeper – Grace is aware that people are watching her, seeing in her what they want to see. Polley can relate: "As a young actress, you are constantly projected upon," she says. "People are trying to pin down who you are, before you yourself have figured out anything." On top of that, she mainly worked for older male directors. "My job since I was a small child was to get very good at figuring out very quickly who an older man wanted me to be, and becoming that, seamlessly," Polley says. "That's not a great way of developing yourself." Polley (through her agent) had tried to buy the rights to Alias Grace when she was 18. Atwood's agent deemed her insufficiently experienced. But when she eventually secured them, a decade later, her first call was to the author. They met in a restaurant on Bloor Street in downtown Toronto, and talked for four hours. Atwood also urged Polley, "'Let's stop being the nice girl who's easy to get along with. Let's grow up and be tough and stand up for ourselves, stand up straight and use your voice,'" Polley recalls. "She's been constantly prodding me toward that." At her most recent birthday party, Polley was talking about a conversation she was terrified to have, and Atwood hit her back – hard – and ordered, "Stand up, Sarah, straighten up!" She meant it literally, and emotionally. Of course, Atwood has courted her share of controversy; this past week, for example, she enraged the Twitterverse by publicly complaining that a planned eight-storey condo would ruin her cozy neighbourhood. But in Alias Grace and The Handmaid's Tale, which was also made into an acclaimed series this year, she's proved disturbingly prescient about how easily societal gains can be snatched away. "I'm extra chilled" by how timely both stories feel, Atwood says. "This is not cause for shouting hooray. I'm appalled that I was freakishly right." Although the two series have brought Atwood a new generation of readers, looking to her for clarity, "If I had the choice – which I do not – I would choose better political conditions, and literary obscurity," she says. "Can I provide any clarity? No! Anything I say in the morning will be contradicted by the events of the afternoon. There's obviously a culture war going on. It's been going on for a long time, but now it's out in the open. Trump is not the only problem. He's the lightning rod, but he did not create it." The white underclass – another theme in Alias Grace – has been here since the beginning of colonization, Atwood goes on: "They were always looked down upon by white elites, and so it has remained. If you allow extreme economic inequality to develop, the underclass will feel resentful of just about everything. But it's too dangerous to blame billionaires – they'll squash you like a bug. It's cheap and easy to blame other poor people who aren't the same as you." Those ideas feature prominently in Polley's adaptation; she feels fortunate to be putting them forward at this political moment. But as rewarding as it's been, she's relieved her two-decade slog has ended. Usually, she's "in a state of joy" while writing a screenplay. But this one, because it touched so many raw nerves, felt "claustrophobic." The good news: It was a 20-year writing boot camp. No future screenplay will ever be as difficult. And she's renewed her commitment to write only things she believes in. When Polley worked with Sam Shepard on Wim Wenders's Don't Come Knocking, he told her he found screenwriting tough, "because you're now expected to tell financers what you intend by every scene you write," she says. "Whereas when art works on someone, it's because something in the writer's subconscious is speaking to something in the reader's subconscious that neither of them understand. I love that idea. Explaining everything robs art of its power. There will always be part of me that doesn't understand this book's power over me."